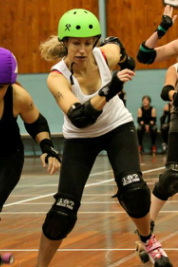 Flip the Bird - e99 - Christchurch Roller Derby. Strong City. Stronger Skaters. Current bench coach, toying with the idea of playing derby again. Typically flipping someone off is meant to degrade, intimidate and threaten the individual receiving the gesture. That on its own makes for a perfect derby name, but it also refers to flipping another gal on the track or just the fact that I am Flip... The Bird. There are many challenges in derby. My feet don't seem to like doing what my brain tells them to do. So picking up the technical side of skating was, and still can be a challenge. But one of the best things about derby is that you are always supported by the coolest bunch of people, invested in your success, all willing to repeat drills until you nail it. I used to meet a friend of a friend at social gatherings and we always ended up talking about her experience with derby. It literally changed her life. I like to stay fit, but biking every other night was getting boring, and derby appealed because of the social angle. So after hearing all the good things about ORDL I gave it a go and was hooked. 100 duck sized horses of course. Birds are scary.